Fig trees can be left alone to grow naturally or trained to grow as a large shrub or mid-size trees of various shapes. There are specific techniques fig tree farmers might use when pruning trees, however, the guidelines below are intended for home gardeners. It is not absolutely necessary to prune a fig tree. However, you can prune young fig trees during the first couple of years in a manner that will produce new "fruiting wood," resulting in heavier yields of fruit the following season. Figs are produced each active growth season on "old wood" (branches produced the previous season). So, to produce more fruit in future seasons you need to produce more branches. If you choose to prune, the first time you should do so is in the first dormant season after having planted your tree. Wait until late winter to prune, but before new growth begins to emerge in early spring. 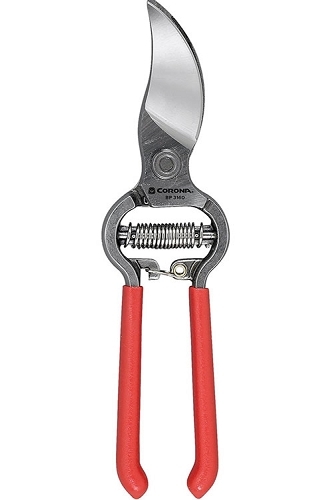 During the first pruning, you can use a pair of sharp hand pruners to prune your fig back by up to half it's size. Doing so will help to stimulate root growth, which helps your fig to more quickly established itself underground. 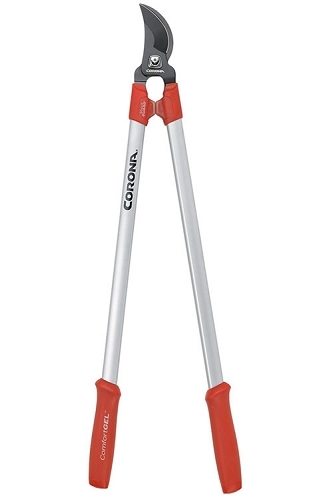 Above ground, this will also stimulate growth of new branches making your tree bushier. In the next late winter, select 4 to 6 of the strongest branches growing from the main trunk(s) to be your fruiting wood / main branches and prune away the rest. As mentioned, leave the 4 to 6 strongest ones, but be sure to stagger them around the trunk. Start pruning by removing any branches that are not growing out from your selected 4 to 6 main branches as well as any dead or diseased wood. If there are suckers growing from the base of the tree, these should be removed as well by cutting them off at their base. Next, remove any secondary branches (shoots growing off the main branches) that are growing at less than a 45 degree angle from the main branches. This step in pruning fig trees will remove any branches that may eventually grow too close to the main trunk and will not produce the best fruit. When all secondary branches have been removed, cut back the 4 to 6 main branches by 1/3 to 1/4 their length. This helps the tree, while it's still young, to put more energy towards the fruit that will be produced next year, which makes for larger and sweeter fruit. Established figs are pruned very little and are productive with our without heavy pruning. Heavy pruning, as described above, should be done only during the first couple years. That being said, you can do some light thinning to remove any weak, diseased or dead limbs or stems. If radical pruning is done to control the size or to rejuvenate an old tree, whitewash the entire tree. TIP: When pruning a fig tree, always keep in mind that if you cut back too much you will not have fruit that year or maybe even the next. Take your time and don't over prune. This being said, over pruning will very rarely harm a fig tree. Where winters are mild, you can train your figs to grow as a tree. To develop a single or multi-trunk tree, the process must be started when the tree is very young. Choose 1 to 3 trunks you would like to keep and remove the rest, cutting them off as low as possible. Then carefully select and remove horizontally-growing lower branches that won't effect the canopy of the tree. As your fig tree grows, remove lower branches as needed to maintain a desired height and form. To keep your fig in tree form, it may be necessary in following years to remove suckers that grow from the base or secondary branches that grow downward. 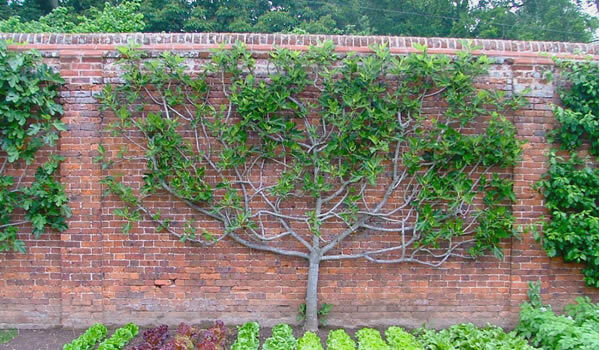 Espalier is a technique for growing plants against a flat, vertical surface, such as a wall of a home or other building. Among the benefits is an abundance of fruit in a relatively small space. 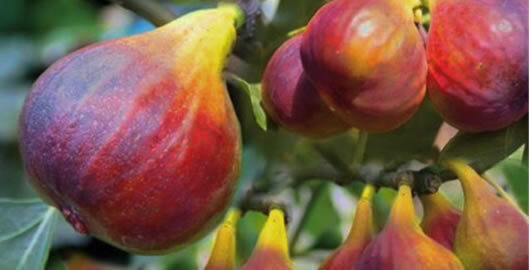 Figs are particular good for espalier because they have flexible branches when young, and they produce fruit when very young. You have many formal shapes in which you can grow the fig tree as espalier: candelabrum, double U-shape, fan shape. But a simple stack of three horizontal tiers emanating from the tree’s base is simple enough. Though you certainly could build your own support structure, first-timers might simply want to buy a strong trellis with a nice design and horizontal bars. Install your trellis against a wall. 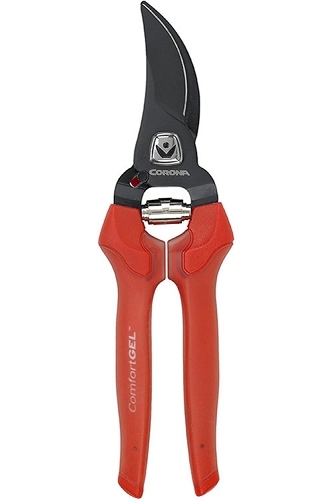 Alternatively, you could attach coated wires to the wall to attach branches to. Plant your fig in the middle of the trellis and allow it to grow. As new branches emerge, gently bend them to the shape of your choosing and loosely tie them to the bars of your trellis using plastic tie tape available at your local nursery and garden center. In the fall when the leaves fall off, remove any weak and crowded branches or stems. You want there to be some space between the branches you keep, unless you want a solid form. During each dormant season thereafter, continue to cut back the overgrown portions. and the top or sides of the tree to a desired shape and size.